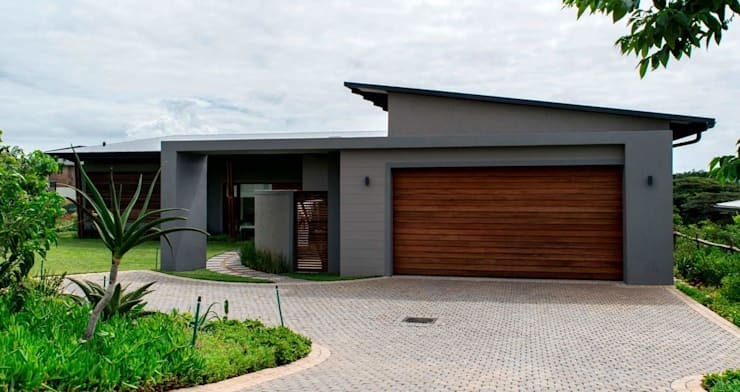 There is nothing better than getting inspiration from local design and decor which is why we at homify are delighted today to bring you 11 stunning South African home entrances. Remember that the entrance is the first impression that people will get of your home so you want it to pack a punch. It should reveal to guests and visitors just how modern and savvy your tastes (and your interiors) are! An entrance should also be functional. Perhaps it should be covered, ensuring people don't get wet or wait in the hot sun while you open the door. Perhaps it should hold a little bench so that people can sit down while they remove boots or jackets. It's up to you! So let's take a look and get inspired! 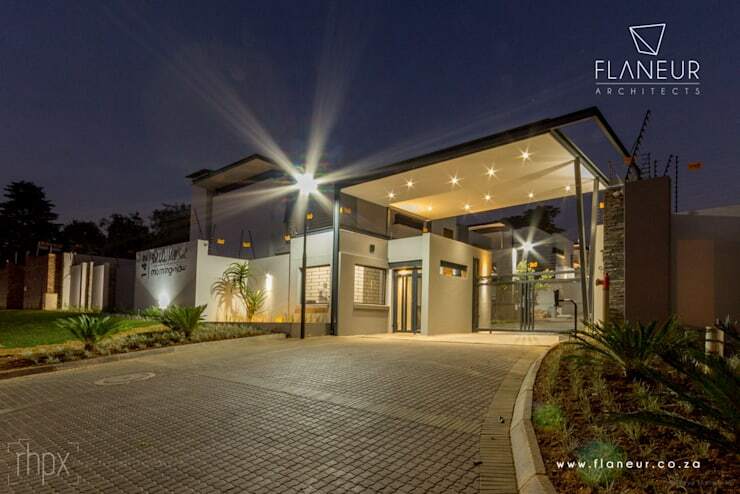 This entrance is very glamorous with its lighting, which illuminates the look and feel of the entrance. 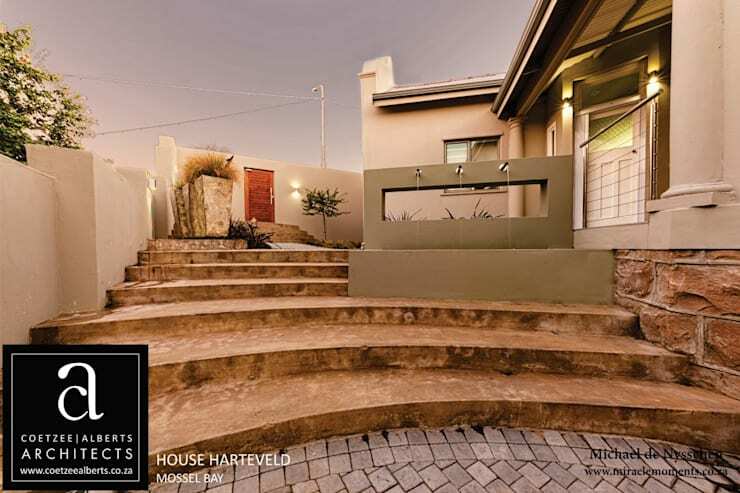 The high walls and front gate make for a safe and private structure, while the front garden softens the original look and feel. This is contemporary in its finest. Encompass visitors, family and friends in warmth and charm the moment that they arrive at your home. 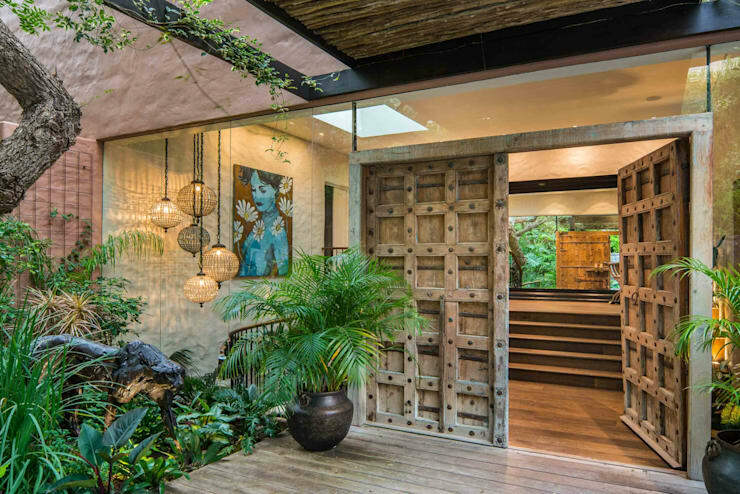 This wooden door works in harmony with the plants, flowers and trees to create quite a tropical and exotic look and feel. Remember that when in doubt, natural beauty is the way to go. 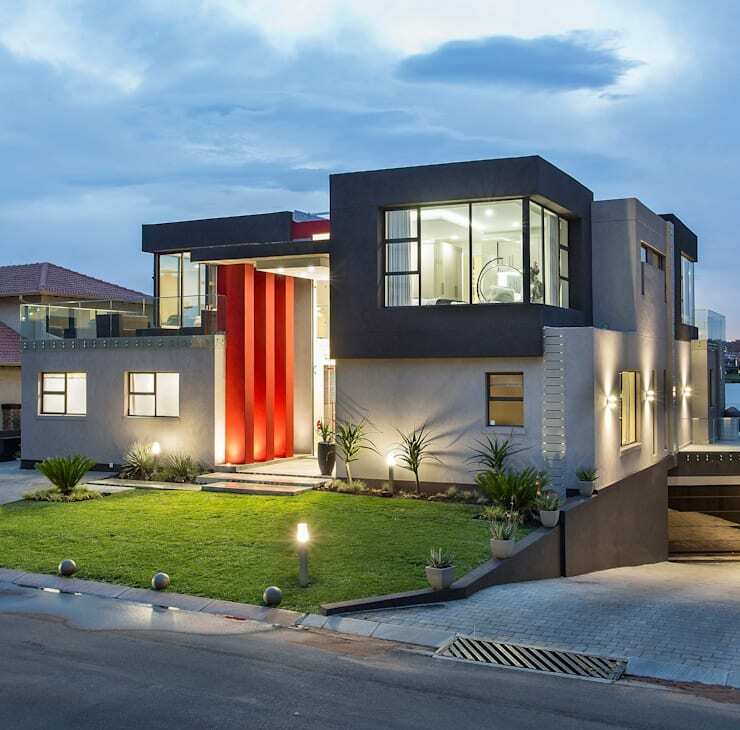 This modern and sleek entrance features three large red beams in the entrance, adding a dramatic and bright burst of colour to the space. It contrasts beautifully with the shades of grey used throughout the facade. Here we can see how beneficial a covered entrance is, protecting guests and visitors from any adverse weather conditions. Paired with a large glass front door, this space welcomes them into the home before they've even stepped through the door! Add hooks or a coat rack to the entrance of your home where handbags, coats and hats can be stored neatly away. You'll thank us later! 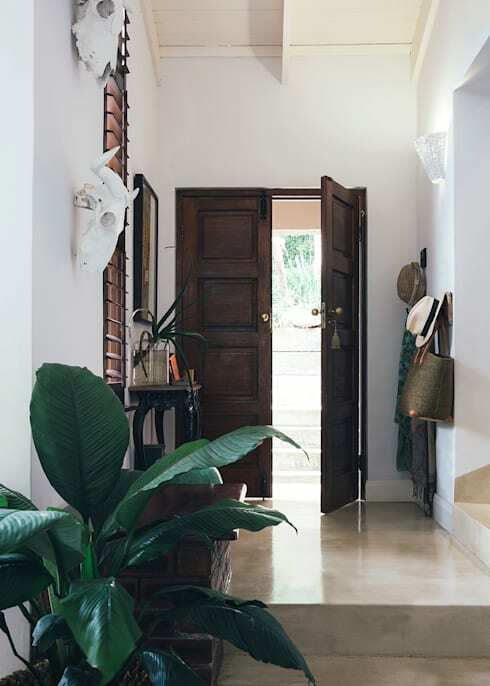 Don't be afraid to add decor or furnishings to your entrance. It should give people a little taste as to what to expect from the rest of the home design! Use artwork, for example, to add charm and personality to the environment. You'll impress guests with your flawless taste! Sometimes a simple and classic design says it all! With grand white pillars and a stone facade, this entrance is set up for greatness. 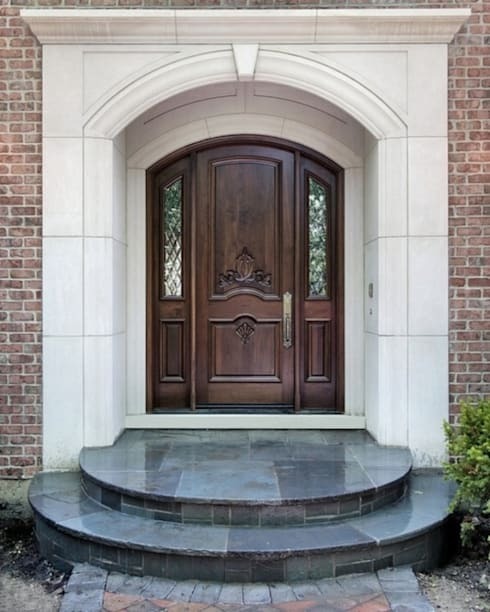 Your front door plays a huge role in the look and feel of your home design. Choose wisely! Dark wood is a timeless material that will look grand and aesthetically appealing for years to come. Don't be afraid to add some patterns or detail! This wooden door opens up onto a spacious staircase with a beautiful look and feel. The combination of earthy tones is very warm and inviting. 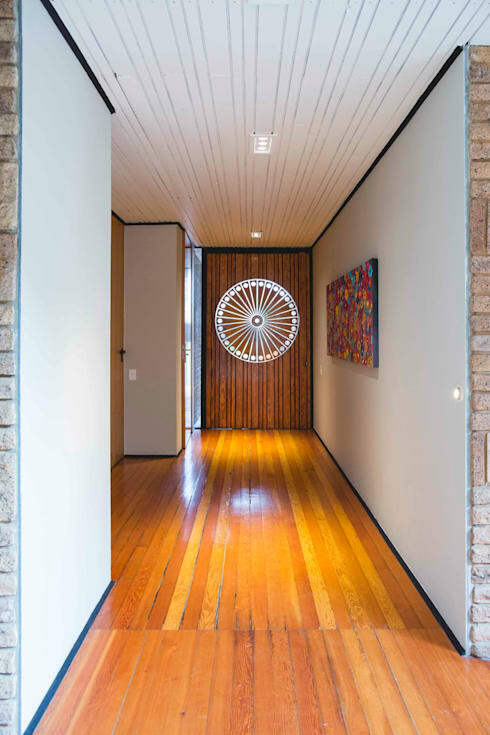 This entrance is light and bright with its white walls and sunshine that streams in through the doors and windows. Sometimes simple and clean is the best option! 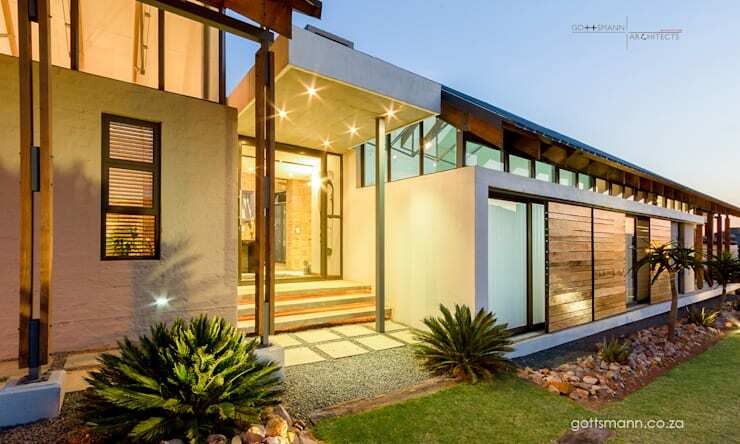 This home uses curved lines to lead guests family and friends into the home design.